The dating app has released details of the most attractive occupations for men and women. Everyone knows the difference a good profile picture makes on Tinder, but what if we told you a change of job could get you more dates? Tinder has released the Top 15 jobs that got the most swipes right in the States, and some of their findings might surprise you. According to the blog, Pilots are the most right-swiped men on Tinder and Physical Therapists are the most right-swiped women. We wonder how many of those men are actually Pilots, though? 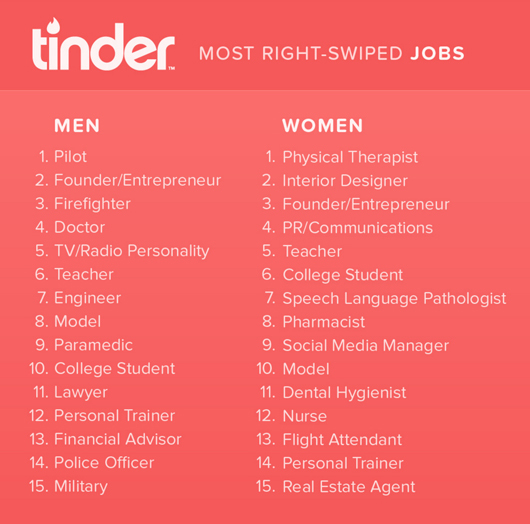 Other jobs which got folks swiping right for men included Firefighter, Entrepreneur and Paramedic, while female Interior Designers, Speech Language Pathologists and Pharmacists also got people going. When it came to how the same jobs fared between the sexes, female teachers made No. 5 of their list, while male teachers made it to No. 6. Surprisingly, Models only appeared tenth on the list for women, while male models came in eighth. Other notable occupations were College Students, which rated well among both sexes, despite not actually being an occupation. The least surprising finding of all, however, may be just how well the role of Entrepreneur performed for both men and women, perhaps proving that having loads of money is a plus for both sexes. If your job didn't make the list, it's not all doom and gloom, as the lists were compiled on user profiles in the US that had the most right swipes from November 2015 - January 2016.